Breaking News: EdTech makes learning a priority! EDUCAUSE interactive graphic tracking top-ten IT issues since 2000. 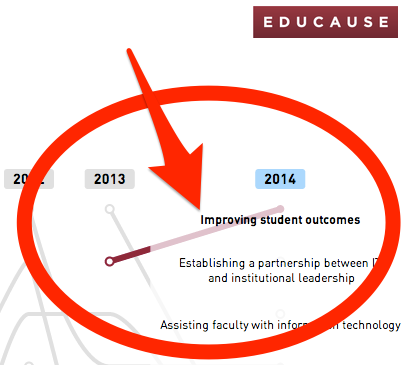 I was taking a look at EDUCAUSE’s 2014 list of the top-ten IT issues facing higher education and was struck that—for the first time in this century—EDU IT’s top focus is on improving student learning! Too often technology is the shiny cart put before the horse of learning, when we should always be asking how technology’s cart can be changed to speed and free learning’s horse. At long last, this EDUCAUSE list says it’s time for us to focus first on learning and then on what technology can do to support it, rather than our all-too-familiar custom of focusing first on new technology and then betting it will support student success. EDU IT can work—and has worked—to improve student outcomes in a variety of ways: a lot of them revolving around infrastructure for the delivery and consumption of teaching and learning. EDU IT has done far less, however, to support innovation in content for learning. The majority of K12 and higher learning still hinges on book-based materials that haven’t seen a radical technical change since Gutenberg. Books are heavy, expensive, linear, material and finite. Meanwhile outside our schools, innovation abounds in the development and delivery of content for learning. One of the most powerful ways EDU IT can improve student outcomes is to focus on supporting the adoption, adaptation and creation of post-book learning experiences that make it easier and cheaper for students to access materials and that track learning pathways and outcomes to help students, teachers, institutions and curricula continuously evolve to improve learning. I love books—and I’d like to thank books for all they’ve done for all of us so far—but books ARE heavy. It’s time for EDU IT to support lighter, smarter learning materials. Looking over the other items on the EDUCAUSE list, I see how each and every one of them can work to support that first priority. If nothing else, this year’s list says more than any other year’s that EDU IT should focus on aligning its work with the central mission of higher education and measuring that work against mission-driven outcomes. Great insights. Thanks for sharing. I love the “books are heavy” statement; the cost alone is a weight many students cannot manage. If we create, share, and remix materials rather than simply rely on the next version of the Intentionally Heavy Book, we can free our teaching, and student learning, from closed, weighty systems. Thank you Trish, for the intentionally heavy book (#ihb)! I’m adding that to my lexicon!